Welcome back to work after a long weekend, busy Wellingtonians (and Kiwis in general)! Here’s hoping that with the benefit of that extra day, everyone had a chance to relax, to have fun, and to see the people they care about with. I spent three lovely days with my Mum, and shout out to her for the photography in this post! Don’t worry, I did let her have some fun, it wasn’t all shooting photos of me for the blog. In the spirit of a bit of post-holiday inspiration, I bring you some bees! Don’t lie in bed this morning and grumble about going back to work (unless it’s really dire) – channel the happy honey bee, pootling about in her mission to gather the most pollen she can so that the whole hive can thrive. Or, you know, be a drone – live fast, die young in an effort to shag a female of your species who is entirely out of your league. Whichever one of those sounds more tempting to you at 6am on a Tuesday, I guess? Bees have a special place in our family as a motif, because us kids were the “Bobbington Bees” through our childhood (and now, to be honest). I think bees are a super creature – and I refer to sharing ideas to solve a problem as “hive minding”, which I’m sure my team doesn’t find at all creepy. At least I don’t ask them to communicate via waggle dancing, is all I can say. 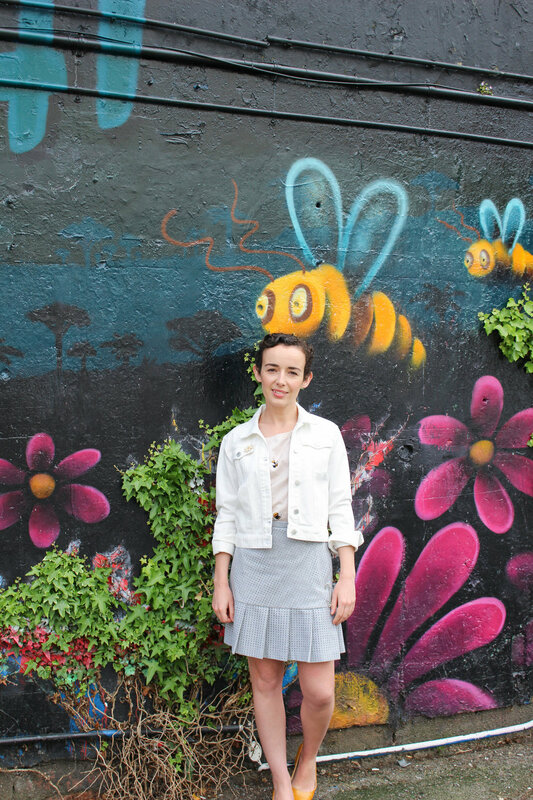 I’ve tried before to find clothes with a good bee motif, but haven’t been particularly satisfied – that all changed this weekend when I took Mum out to Wanda Harland in Petone. The bees themselves are a reasonable size and the distribution of the pattern, which looks randomised, means the bees look more “real”. Some of the bees even look like they’re talking to each other! 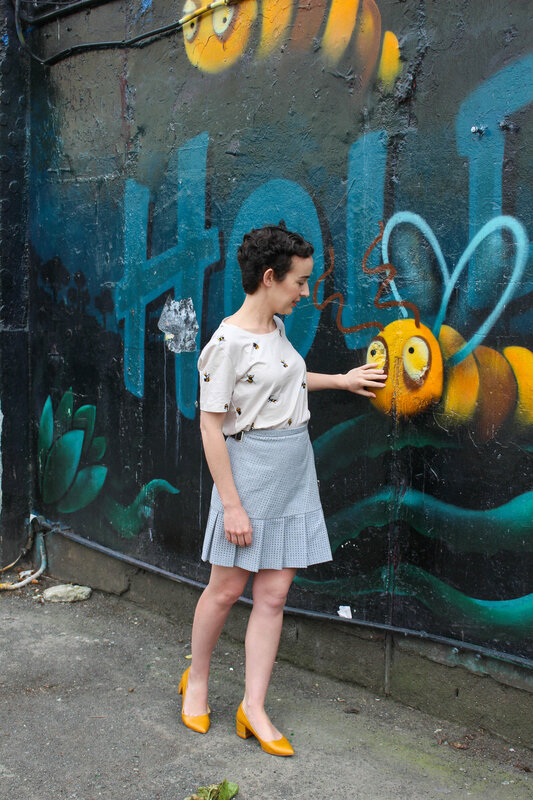 The bees look painted on to the tshirt, which introduces more colours (including a light grey in the wings) and looks more sophisticated as a print. A bit of variety in a print like will always look a bit more effective and less mass-produced than a perfectly repeating print. 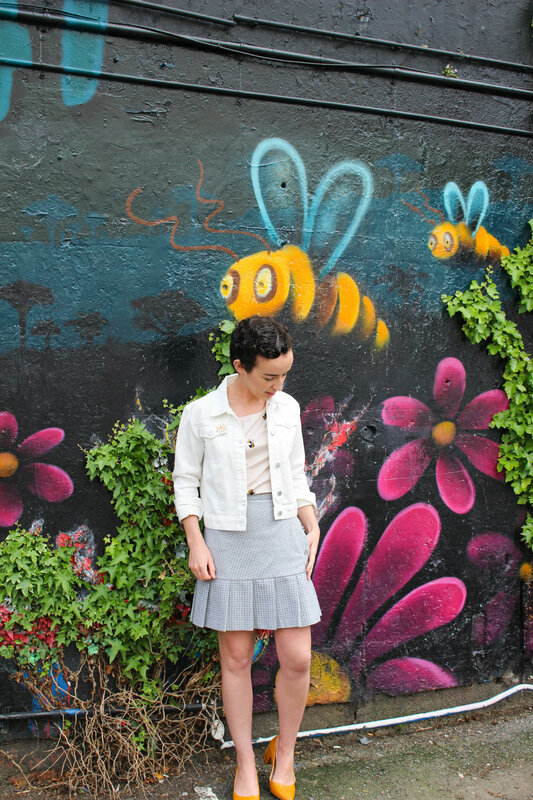 I’ve paired it here with a grey mini-kilt from Le Kilt x Asos and the white denim jacket I picked up in early spring (later that day, had to wash it because I got lipstick on it – is this a great purchase, it’s TBD). Since I was already pulling all the colours from the bee print, it totally made sense to just lean right into the whole thing and go for yellow shoes. However, if you wanted to be a less of a puzzle of colours and textures, Bobbie suggests wearing this with high-waisted black trousers, knotted at the waist, and I have to say I am feeling that styling too. As my pallid legs testify, sun isn't yet a plentiful resource here in Wellington, so it will be a little while before anything gets knotted at the waist. Shirt from Stine Goya at Wanda Harland, out of stock but there are so many other delicious things (including this incredible shirt). Skirt is Le Kilt x Asos, no longer available but there is a pretty pink option and a lip print option. Denim jacket is out of stock already (yeesh! ), but here are some alternatives from The Iconic (where I bought mine). Shoes are super old Zara jobs, perhaps try these yellow shoes instead!